May Freerolls – We’re giving away $100 Every Day at Carbon this Month! From now until the end of May, RakeTheRake are holding two $50 freerolls a day at Carbon, exclusively for RTR players with a Carbon Poker rakeback account. That’s $100 a day, every single day for the rest of the month. These freerolls aren’t open to anyone else, so if you don’t have a Carbon account with RakeTheRake, then sign up for Carbon Poker Rakeback today and you’ll be eligible to take part in this freerolls as soon as your account is confirmed*. For full details check the freerolls section of our promotions page, and look under Carbon Poker for “$3,000 – 60 Freerolls”. *Allowing for weekends or holidays confirmation of accounts can take up to 96 hours. 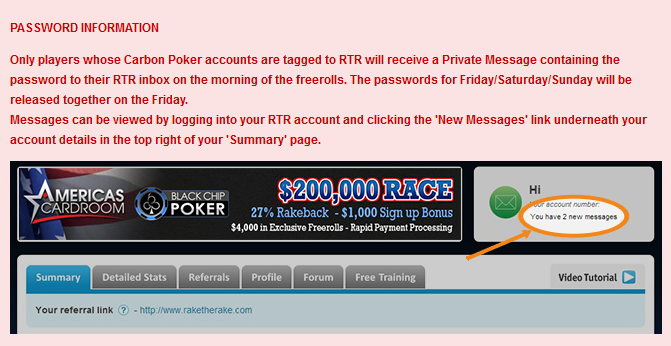 If you think you should have received passwords and you haven’t had a message in your RTR inbox, then please contact our support team with your RakeTheRake details. How cann i get the password for the freeroll on Americas cardroom ? RakeTheRake’s New $250 Facebook Freerolls! RakeTheRake’s Monthly Facebook Freerolls Now Offering $500 at PokerStars, Party Poker, WPT, and bWin! Home » Rakeback News » May Freerolls – We’re giving away $100 Every Day at Carbon this Month!